SARACENS WILL NOT appeal the 13-week ban handed out to wing Chris Ashton for biting, the English and European champions said today. However, they will continue to back the prolific controversial winger. Ashton was punished for biting Northampton’s Alex Waller during a Premiership match last weekend. A three-member disciplinary panel found on Tuesday that Ashton bit Waller on the arm in the 24th minute of Saracens’ 27-12 win, but cleared him of a charge that he bit him again one minute later. The punishment keeps Ashton out of action until December 19, meaning he will miss out the November internationals as well as Saracens’ opening four European Champions Cup fixtures – against Toulon, Scarlets and Sale Sharks (twice). Saracens had the option to appeal against the suspension but the London club’s director of rugby, Mark McCall, said: “The club has been fully supportive of Chris throughout this process and we are naturally disappointed to lose a player of his calibre for 13 weeks. We put forward what we thought was a strong case for both charges to be dismissed but the decision to suspend Chris is one that we accept. No appeal will be lodged. The 29-year-old received a 10-week ban last season for making contact with the eye area of Ulster centre Luke Marshall in a Champions Cup clash, ruling him out of this year’s Six Nations. Email “Saracens back down from appealing Chris Ashton's 13-week bite ban”. 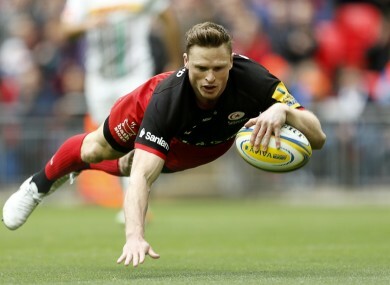 Feedback on “Saracens back down from appealing Chris Ashton's 13-week bite ban”.